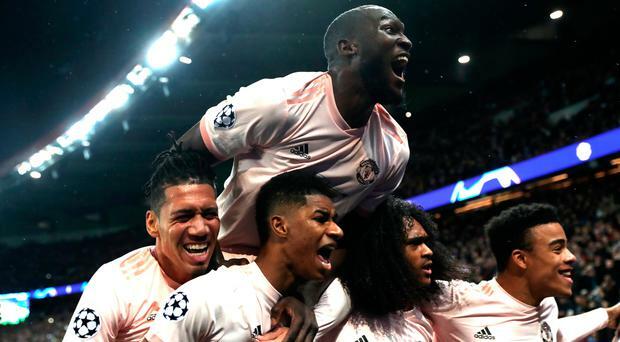 Miracle man Ole Gunnar Solskjaer must surely land the Manchester United manager's job now after masterminding an historic comeback win in the Champions League last 16, beating PSG in Paris 3-1 to go through on away goals after a late and controversial VAR decision intervened to award a penalty. Romelu Lukaku scored twice in the first half, including an opening strike within two minutes of kick-off, either side of Juan Bernat's reply, but United seemingly couldn't break the deadlock in the second half. In the dying minutes, Presnel Kimpembe's arm blocked Diogo Dalot's shot, and the referee consulted VAR in order to determine whether it was a handball. After several minutes of consideration, the referee returned to the field to stun the Parc des Princes by awarding the spot-kick, which Marcus Rashford fizzed past keeper Buffon. Caretaker boss Solskjaer, who has lifted United to undreamt of heights since taking over from sacked Jose Mourinho in December, described the win as: "Fantastic. The belief in the boys was just what we hoped for. It was a great start. We started with a plan to get the first goal, but we didn't expect it to come so soon. "Rashford, he's 21, there were no nerves whatsoever, fearless." When asked about the prospect of taking over on a permanent basis, the Norwegian added: "Until the summer, let's see what happens." But the job is surely his. Matchwinner Rashford, when asked what he was thinking as he stepped up to take the penalty, said: “Just keep a cool head. “They are the type of thing you practice every day and I wanted to take it. United’s hopes of overcoming PSG dwindled as a largely uneventful second half went on. Dalot’s late speculative shot which led to Kimpembe’s handball was United’s first attempt since the break. Solskjaer turned to youngsters Tahith Chong and Mason Greenwood, who made his senior debut due to a raft of injuries in United’s ranks of late. “Everything seemed to be against us, but we believe that we can always do something,” Rashford said. Two-goal striker Lukaku said he enjoyed playing alongside England international Rashford. He said:“It was good. We were confident the day before the game. “Me and Marcus, in the last game against Southampton, as a pair up front, we knew that we could do the business today too. Today we played together, it was a pleasure to play like that, and we both scored, so we’re happy! “For the second one, I told him every time he shoots I’ll follow the ball as well, and that happened too. “We just keep going. I think everything starts at the training ground. We do a lot of games — five v fives and six v six, eight v eights — and the competitiveness starts there.